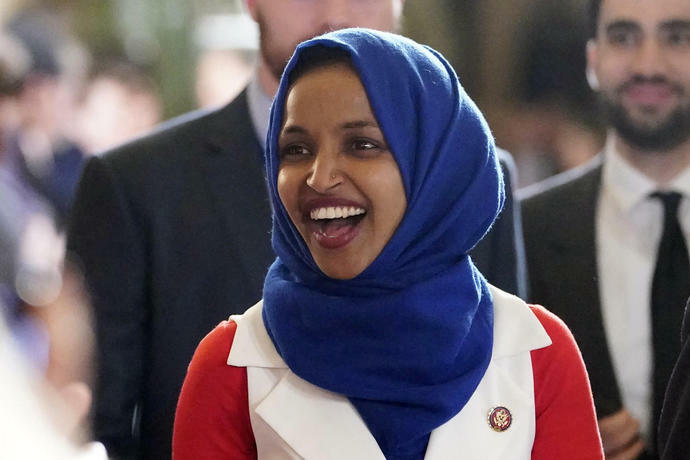 WASHINGTON (AP) - Freshman Democratic Rep. Ilhan Omar "unequivocally" apologized Monday for tweets suggesting that members of Congress support Israel because they are being paid to do so, which drew bipartisan criticism and a rebuke from House Speaker Nancy Pelosi. The statement was the latest reckoning among Democrats of intense differences in their ranks over the U.S.-Israeli relationship, highlighted by criticism from Omar and Rep. Rashida Tlaib of Michigan. They are the first Muslim women to serve in Congress and both have reported being harassed. Pelosi and other Democrats, including leaders and chairmen, laid down a marker making clear that Omar had overstepped. But senior Democrats dealt the new lawmaker a swift schooling. "There is an expectation of leaders - particularly those with a demonstrated commitment to the cause of justice and equality - that they would be extremely careful not to tread into the waters of anti-Semitism or any other form of prejudice or hate," House Judiciary Committee Chairman Jerrold Nadler of New York said in a statement. "Rep. Omar failed that test of leadership with these comments." Minnesota Sen. Amy Klobuchar supported the Middle East bill, while her potential presidential rivals - Sens. Elizabeth Warren of Massachusetts, Kamala Harris of California, Cory Booker of New Jersey, Kirsten Gillibrand of New York, Bernie Sanders of Vermont and Sherrod Brown of Ohio - all opposed it. Several of those Democrats had raised concerns that the bill's bid to rein in anti-Israel boycott efforts risked violating the constitutional rights of activists, although all the senators are opposed to the Palestinian-led push itself.